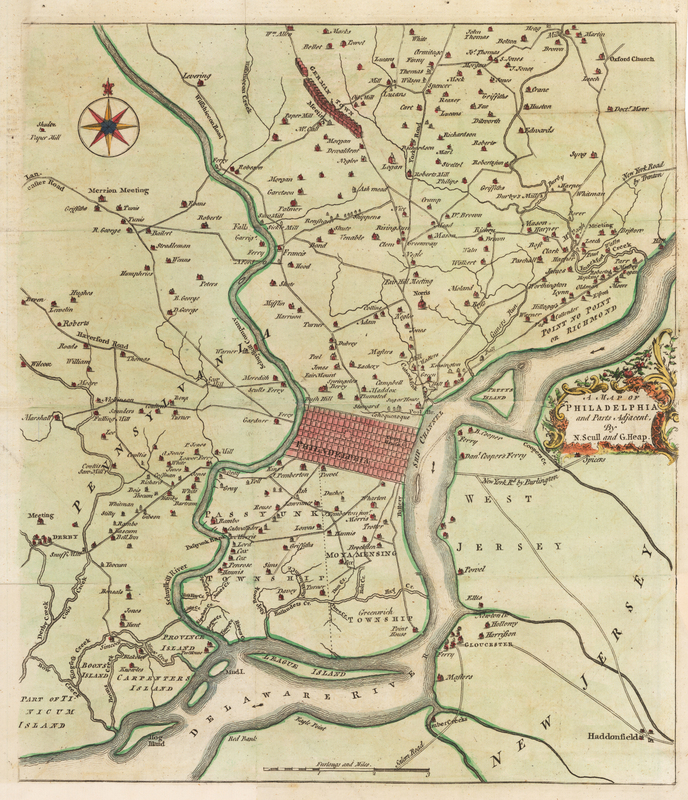 This is a well-preserved example of the rare Scull and Heap map of Philadelphia which was first published in 1752 by the Gentlemen’s Magazine, a British periodical. The map features a grid plan of the center, in which a large square and the Philadelphia Court House are indicated. More detailed information is provided regarding the surrounding regions, where roads, mills, houses of prominent people along with the families’ surnames are noted, along with services such as ferries. Also to be found is German Town to the north of the city proper, along with multiple roads, meeting houses and mills noted throughout the area. The Delaware River system is noted in detail. Condition: This hand-colored map is in A condition. A minor separation at the right edge has been repaired with archival material on the verso.